Spend too much time at the computer? Wake up with a crick in your neck? Are your shoulders just always a little achy? Here’s a Neck and Shoulder Sequence to bring greater mobility in your shoulder blades, relieve achiness between your shoulder blades, cultivate more strength in the arms and Serratus Anterior, and free up your neck. Adho Mukha Svanasana: let this be like taking a “before picture” of how your neck and shoulders feel so you can see how the series has changed things when you do a second AMS later. Hold for 6 breaths and then come to standing. Shoulder Circles: Go slowly and work all the circles (forward, backward, alternating and opposites). 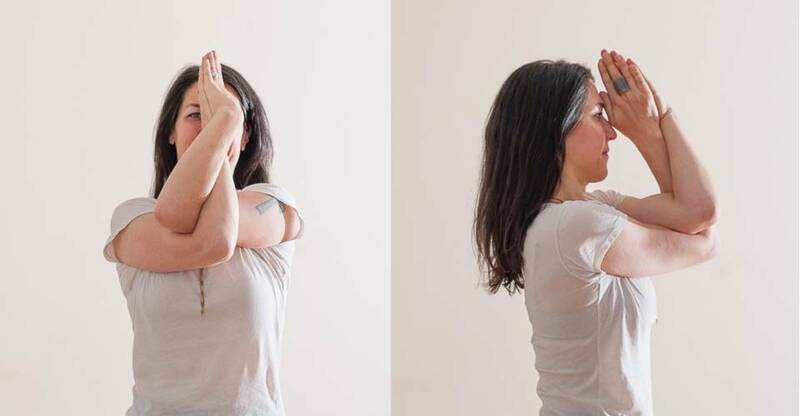 Three directions of the Neck/”Yes, No, & Maybe”: Standing in Tadasana, and keeping the head level, first turn the head right while stretching the left collarbone in the opposite direction. Then, come back to center and change sides (“No”). Next, keeping the right side of your neck long and making the left side longer, lift your left ear away from your left shoulder without turning the head any. Stretch down through your left arm and hand to increase the stretch. Come back to center and change sides (“Maybe”). Lastly, keep the front of your neck long and make the back of your neck longer as you drop the chin and the shoulder blades down. Come back to neutral, and make the back of the neck long as you lift the chin and drop the collarbones down (“Yes”). Lacrosse Ball Work: With just the right amount of pressure, roll a lacrosse ball up and down between the spine and the shoulder blade to break up tension in the rhomboids and upper and mid-trapezius. Garudasana Arms: On the inhalation, hug the arms into the sockets and on the exhalation, spread the shoulder blades. Classical Surya Namaskar: (see how well you can remember the sequence or check out this hyperlapse video of one side on my Instagram) Do 1 – 3 rounds total. Trikonasana: Focus on the neck and shoulders in the pose, stretching the top arm up and pressing the bottom hand down, while working to turn the neck freely and easily to look up at the top hand. Front Shoulder Stretch: This is the pose featured at the top of this post. Use a Three Minute Egg or a block and squeeeze those shoulder blades and upper arm bones together to stretch the front of your chest. Adho Mukha Svanasana: Here’s your chance to take an “After Picture”. How do your shoulders feel differently than the “Before Picture”? Is there greater freedom in the neck? Supported Setu Bandha: Get an inversion in while creating even more space in the front of your chest! Shavasana: Rest and feel the shoulder blades on the ground, moving towards your waist. Turn the palms up to create more opening in the armpits. Place a small neck roll under the neck to support your cervical curve. Alrighty, folks! Hit the mat and let me know how this sequence feels on your neck and shoulders.